Too often, working mothers are expected to work as if they didn’t have children and to raise children as if they didn’t work. Unless you dedicate some time to taking care of yourself, you will get sick, compromise your work, and unintentionally undermine your parenting. Self-care could be as simple as taking 20 minutes each night to lie on the floor and breathe slowly or going for a morning walk by yourself. Make a self-care promise. Your brain and body will thank you! Use planners, calendars, and lists to keep everything and everyone on track. Establish morning, evening, and weekend routines to keep things humming. Be sure to delegate tasks to other family members. As hard as you try, you will never get it all done alone! Recruit family, friends, and neighbors to function as backup when you’re stuck in a meeting or need extra help. Is there another parent you can share driving duties with? A neighbor willing to feed the dog if you’re running late? A strong network of support can significantly reduce your stress. 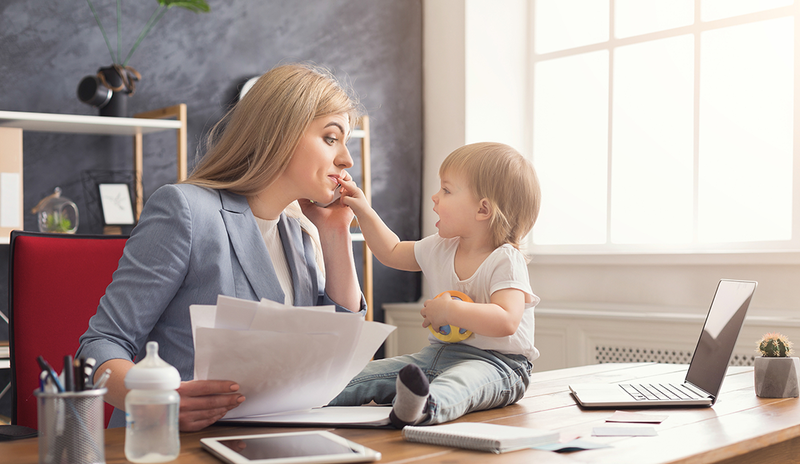 Recognize that you may run into challenges at work when others fall back on stereotypes and myths about working mothers. Try to see the big picture instead of assuming the worst. For example, instead of feeling hurt that your boss never asks you to travel, make sure they know you’re willing to leave the kids for a day or two. Efficiency hacks can lessen your load. My kids do homework at the kitchen table so that I can help them while making dinner. I also call family and friends while food shopping so I can focus on work at the office and the kids while at home. I know you, too, can think up new ways to make things just a little more manageable. Sometimes it’s as simple as asking the kids to pitch in more! Are you a whiz in the kitchen but a reluctant cook? Maybe you’re an early bird and not a night owl? Capitalize on your strengths. I own the fact that I’m productive at night and crabby in the morning by getting everything organized in the evening. Feeling worthy has a big payoff in all aspects of your life, so do you! When you need advice or empathy, your connections with other working moms are invaluable. Whether you turn to your tribe to cry together, laugh hysterically, or brainstorm, there is a special beauty in knowing that these people really get it. Your juggling act won’t always be perfect, so don’t sweat the small stuff. Better yet, learn to laugh at the fact that your briefcase is filled with crayons or your blazer has spit-up on the shoulder (true story). With so many moving parts in their lives, working moms need to embrace flexibility. If something doesn’t go as planned, make a new plan on the spot. A nimble mindset is an asset at work and home; more importantly, it greatly reduces stress. Working moms often get down on themselves for no good reason. So what if you ordered out for three nights in a row, or your kid watched TV while you had a conference call? Try to focus instead on wins, such as your child learning to read or your recent promotion. In the long run, children benefit from having a mom who is hardworking, confident, and fulfilled. Celebrate all the amazing feats, large and small, that come with the Herculean effort of being a working mother! Marika Lindholm is the founder of ESME.com (Empowering Strong Moms Everywhere). For more than a decade, Marika Lindholm, Phd, taught courses on gender and management and managing workforce diversity at Northwestern University. Lindholm is the founder of ESME.com (Empowering Strong Moms Everywhere), a social platform dedicated to empowering mothers through resources, support, and connection.